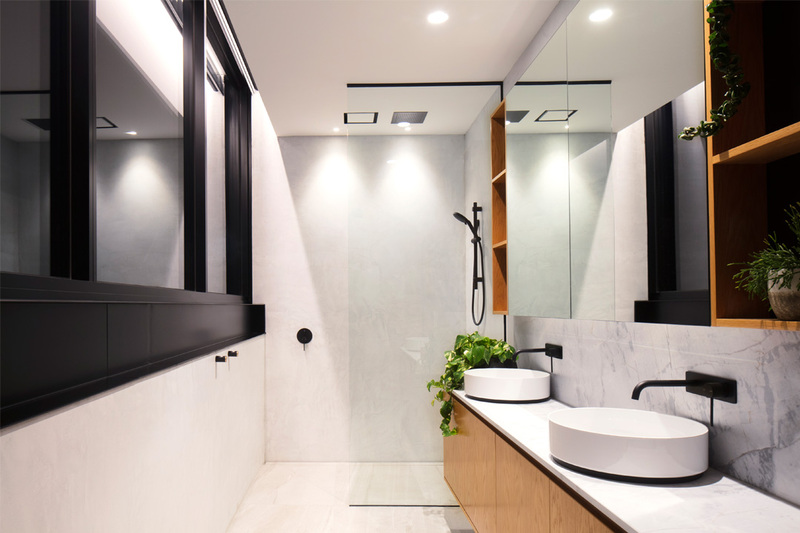 This private residence in Ascot Vale features a minimalist style and high functionality. A combination of Unios luminaires and bespoke pendants provide beauty and practicality to the home. A palette of natural elements, including wood and marble, combines with black aluminium accents to create a bold and dynamic aesthetic. Lights Lights Lights worked closely with the client to bring every detail of the space to life. 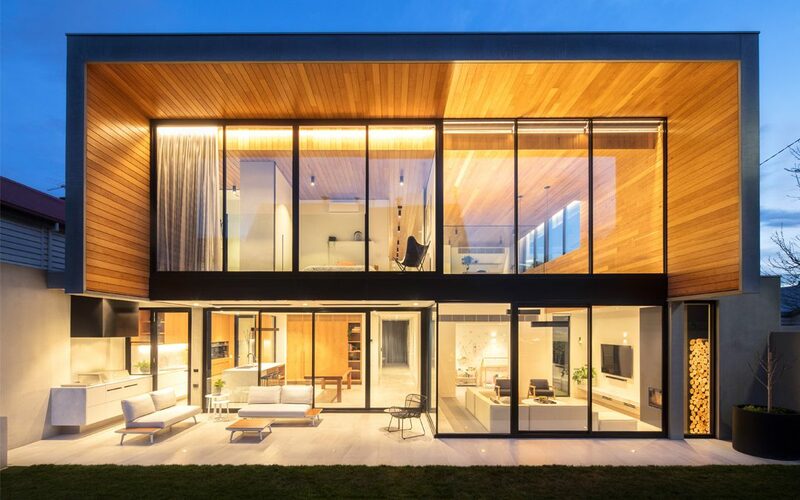 The rooms are connected by the cohesive wood elements, which provide visual warmth. Surface-mounted and recessed Titanium Downlights beautifully highlight the colours and grain of the wood. The focus on natural materials flows throughout the kitchen, dining and living areas. The marble benchtops are cut at straight angles to match the horizontal lines of the wood. These straight lines are further enhanced with Eclipse Strip Lighting for a striking effect. The defined rear of the residence is equally sculptural and inviting with its framed-wood cladding and glass façade. A series of bespoke pendant lights interplay with FGR Architects’ angular design while integrating seamlessly with the interior spaces. Renowned for its extensive range of indoor and outdoor lighting, Unios is considered a market leader in architectural lighting. The company has an innovative approach to design, manufacturing and customer service, which results in striking products that are built from high-quality and long-lasting materials. 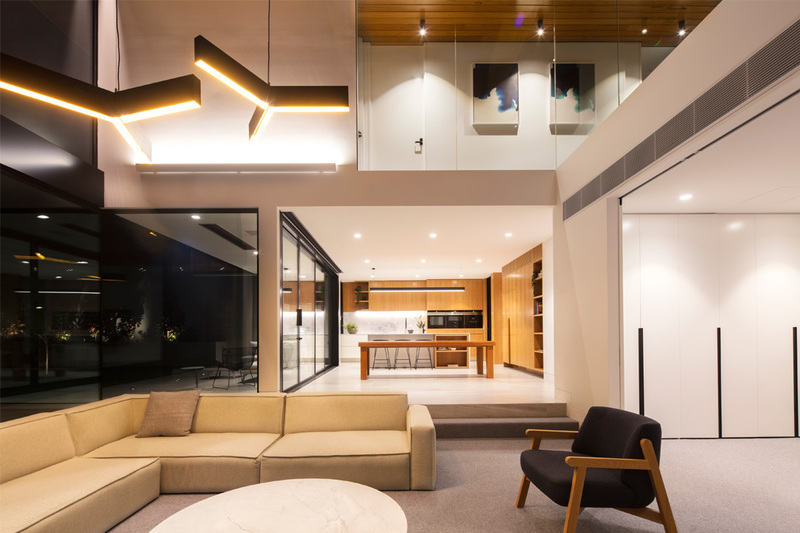 With a vast range of modern and minimal lighting products available, you’ll be sure to find the right fit for your home. Whatever you require, Unios’ impressive product range will exceed all design-performance expectations.